Snoring isn’t just a noisy nuisance. In addition to being loud enough to disturb both the snorers and their family, snoring can also interrupt sleep and, therefore, cause fatigue. 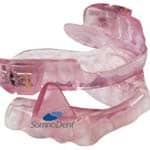 Snore guards are highly effective solutions for the majority of patients to the problem of snoring and mild to moderate Obstructive Sleep Apnea.